William Campbell Mayfield was apparently a half blood Cherokee Indian. He probably was named after Brigadier General William Campbell (1745-1781) of Washington County VA, who commanded the American forces at the Battle of Kings Mountain on 07 October 1780. In 1783, the approximate time that William Campbell Mayfield was born, it was very common for people living on the Frontier to name their children after heroes of the Revolution. William Campbell Mayfield was born in North Carolina - probably in Washington County, about 13 years before that county became part of the new state of Tennessee. In the early 1780's the Cherokee Nation directly bordered Washington County and there were many Cherokee towns nearby. In the early 1780's several Mayfields were living in Washington County, some of these men may have taken Cherokee wives from the nearby Cherokee towns. During the late 1780's, most of these same families removed to Greenville and Pendleton Counties in South Carolina. William's parents are unknown, but his father is almost certainly one of the early Mayfield settlers of Pendleton County who took up land along one of the creeks (probably Goldens Creek) which feed into Twelve Mile River in northwestern South Carolina. Prior to 1777, this area had been an integral part of the Cherokee Nation but, after several major military defeats suffered by the Cherokees in the Revolutionary War, they reluctantly ceded the territory to the State of South Carolina on 20 May 1777. Due to continued fighting in the South Carolina Backcountry during the Revolution, few if any whites settled in the area until the 1783-1785 time frame. William's mother probably was a Cherokee of either mixed or full blood. At the time the Mayfield settlers entered into the Twelve Mile River area, there were probably many Indian families still living there. White men who had Cherokee wives would have found the transition to life in this area of frontier South Carolina much easier. Some of the Mayfields may have acquired Indian wives when they were still residing in Washington County NC. We do know that one of the early Mayfield Settlers, Stephen Mayfield (d. 1834), took a Cherokee wife named Jack or Jock in around 1785, when he was either in North Carolina or South Carolina. My name is Green Bean. I am 82 years of age and reside in Van Buren, Arkansas. 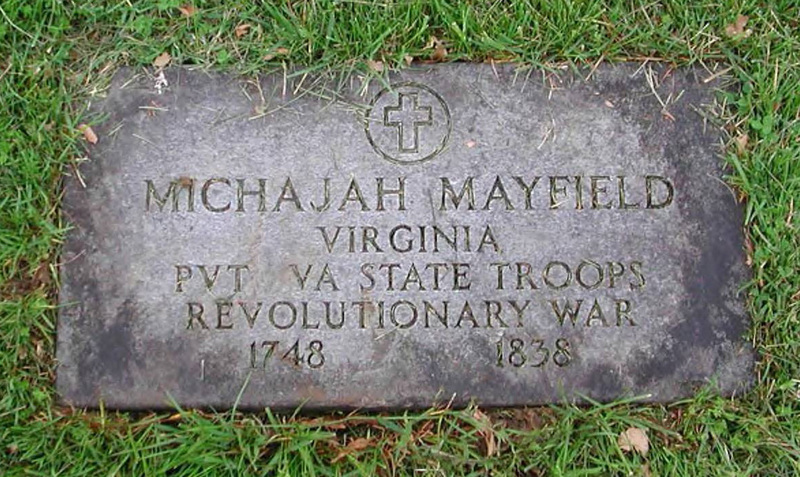 I was acquainted with William Campbell Mayfield, who was known as “Fox Hunter Mayfield” at the time I knew him, which was about from forty to forty-five years ago, or some years before the War of the Rebellion. Some years before the war I was running a carding factory at Dutch Town near Cane Hill, in Washington County, Arkansas, and while there I got acquainted with said William Campbell Mayfield and saw him frequently around the Factory for a month or two, after which he went away and I was informed that he had gone back East to the Old Cherokee Nation. He was a one -eyed man, and about one-half Cherokee Indian to the best of my judgment. He associated with the Cherokee Indians who lived just across the line in the Cherokee Nation, and was generally received and recognized by them as a Cherokee Indian. He was introduced to me by some of the Cherokees, as a Cherokee who had come out there from the old Cherokee Nation back East. The Indians who came with him and associated with him had been acquainted with him back in the Old Cherokee Nation. 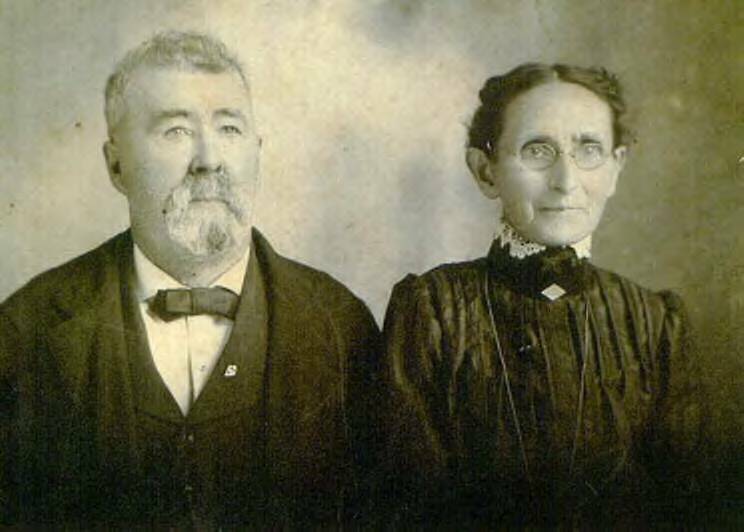 I was also acquainted with Pearson Mayfield, who was a son of William Campbell Mayfield, and who came to this country from the Old Cherokee Nation and settled near Van Buren. Pearson Mayfield showed Cherokee Indian blood and was about one-quarter Cherokee Indian. Subscribed and sworn to before me this last day of August 1896. 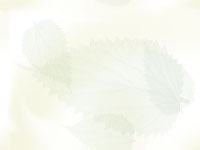 And I further certify that the said Green bean is to me well known, and that he is a credible person. My Commission as a Notary Expiring Oct. 22 1898. 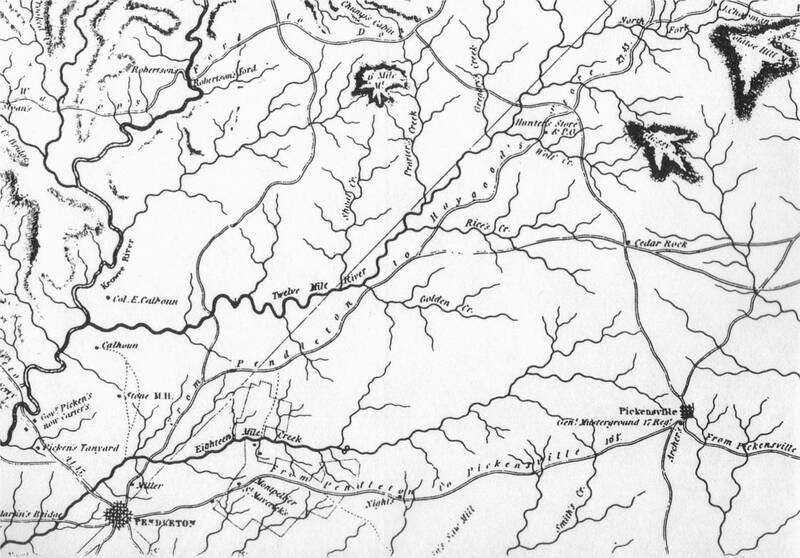 Map of the Twelve Mile River area of Pendleton County SC - in 1826 this area became a part of Pickens District. Goldens Creek, Rices Creek and Wolf Creek are all located in the upper right portion of the map. The above image was created from a digitized extract of the 1825 Mills Atlas map for the Pendleton District. The early Mayfield settlers of Pendleton County (later Pickens District) acquired land lying on the tributaries of Twelve Mile River. In particular, many of these Mayfield settlers, including William Campbell Mayfield, and his sons: Pearson Mayfield, Israel Mayfield and Reuben Mayfield; all seem to have resided on Goldens Creek at one time or another. The following land records from Pendleton County and later Pickens District support this conclusion. 07 March 1789: Pendleton County is created from a previously unorganized area of South Carolina that had formerly belonged to the Cherokee Nation. 19 February 1791: Pendleton becomes part of newly created Washington District. 01 January 1800: Pendleton District created from Washington District, having the same boundaries as Pendleton County. 19 December 1816: Pendleton District gains additional territory up to the Chattanooga River; the Cherokee had ceded this land to South Carolina by treaty of 22 Mar 1816. 20 December 1826: Pendleton District abolished by being divided into two new districts - Anderson and Pickens. I have not been able to find William Campbell Mayfield (1783-1857) in the Federal Census reports for 1800, 1810 and 1820. However, he does appear in the Pickens District SC Federal Census enumerations for 1830, 1840 and 1850. William died in Hall County GA in 1857. Enumerations for his six sons and three daughters appear in the Federal Census reports for 1850, 1860 and 1870. These enumerations are summarized below. 295 William Mayfield 2 2 1 0 1 0 0 0 3 0 0 1 0 0 0 0 The male in the 40-50 age group is William Campbell Mayfield (1783-1857). The 2 males in the under 10 age group are probably William's sons Reuben (b. 1821) and William Sidney (b. 1824). The 2 males in the 10-20 age group are probably his sons Pearson (b. 1811) and Israel (b. 1814). The male in the 20-30 age group is unknown to me - perhaps another son who died before 1840. The female in the 30-40 age group is William's 2nd wife, Temperance Kennemore (b. 1799). The 3 females in the under 10 age group are probably William's daughters Naomi (b. 1817), Elizabeth (b. 1823) and Mary (b. 1828). Please note that Elizabeth Kennemore and Lot Kennemore (see below) are both listed directly next to William Campbell Mayfield in the census. 295 Elizabeth Kennemore 0 1 0 0 0 0 0 0 0 0 1 1 0 0 0 1 The woman in the over 70 age group is Elizabeth (nee Riley) Kennemore (b. 1750), the widow of George Kennemore (d. 1828) and the mother of William Campbell Mayfield's two wives Phoebe and Temperance. 295 Lot Kennemore 2 0 1 1 0 0 0 0 2 2 0 1 0 0 0 0 This is William Lot Kennemore (b. 1800), youngest son of George and Elizabeth Kennemore. 379 William Mayfield 2 1 0 0 0 1 0 0 0 4 0 0 1 0 0 0 This is William Campbell Mayfield (1783-1857), the husband of Temperance Kennemore. Temperance died testate in Pickens District SC in 1859. The 2 males in the under 10 age group are probably William's sons Duncan (b. 1833) and Baylis (b. 1834). The male in the 10-20 age group is probably his son William Sidney Mayfield (b. 1824). Three of the four females in the 10-20 age group are his daughters Naomi, Elizabeth and Mary. The fourth person is unknown to me - perhaps another daughter who died young. The female in the 40 -50 age group is William's 2nd wife Temperance Kennemore (b. 1799). 381 Reuben Mayfield 0 0 1 0 0 0 0 0 0 1 0 0 0 0 0 0 Reuben (b. 1821) is a son of William Campbell Mayfield. 381 Israel Mayfield 0 0 1 0 0 0 0 0 1 0 1 0 0 0 0 0 Israel (b. 1814) is a son of William Campbell Mayfield. 393 Pearson Mayfield 2 0 1 0 0 0 0 0 0 0 0 0 0 0 0 0 Pearson (b. 1811) is a son of William Campbell Mayfield. 508 William Mayfield 67 M Farming $2000 NC This is William Campbell Mayfield (1783-1857), husband of Temperance Kennemore (born 1799). 508 Temperance Mayfield 51 F SC Second wife of William Campbell Mayfield. 508 Duncan Mayfield 17 M Laborer SC Son of William Campbell Mayfield. 508 Baylis Mayfield 16 M Laborer SC Son of William Campbell Mayfield.